Much of my client work revolves around helping people to take action. Most of my clients are trying to find a way to use their gifts and talents to help those around them in some way, but for some reason are holding themselves back. 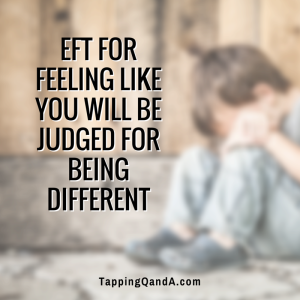 This inability to act often stems from times in their childhood or more recent past where they were judged harshly by their loved ones for being different. When this happens it makes perfect sense that they wouldn’t feel comfortable using their giftedness in the present. Today’s podcast is a tap-along aimed at this exact issue. Even if you don’t feel like this applies to you, you might be surprised how this type of experience may be impacting you subconsciously. Take a few moments to tap along. Thank you, Gene. This is a very powerful tapping session. I will definitely listen to this again as I discover specific aspects of my life that will benefit from it. Thanks for everything you do! Thank you for this powerful tapping. What struck me Is that many people experience this, to the point you created this audio. It just goes to show how unique each of us is, and yet we see ourselves as “different.” Thanks for the great content! I think one of the biggest problems we face is we are comparing our inside to other peoples outside…That is why we feel different.